~ My girlfriend and I recently adopted a 1 year old German shepherd from a local shelter. We soon learned that watching episodes of the Dog Whisperer, reading multiple books, and articles online just weren’t enough to correct the separation issues, lunging at other dogs, barking and pulling on walks. We reached out to Tracy at Grey Dog and haven’t looked back since! Tracy instantly honed in on Melody’s issues and the changes in behavior were immediate. And not only did Melody make significant progress during the session, but Tracy equipped us with the right tools to make sure that the progress continues. It has been a week since the session and we haven’t had the slightest issue with the aforementioned behaviors! It’s as though we have a completely different dog. Since the session, Tracy has checked in daily to see how Melody is doing with her new structure and to make sure that all of our questions are answered. What a rarity and comfort. Not only are we very grateful and happy for what we learned, but Melody is visibly happier too. Thank you for changing our lives Tracy! ~ We were at our wits end with the behavior of our high energy, mischievous little, rescue pup Murphy. He was constantly jumping up on people, excessively barking, pulling during walks, and slowly taking over our entire house. We contacted Tracy to help us deal with his behavior before he hurt himself or someone else. In just one session Tracy had Murphy acting like a different dog, we were amazed at how he responded to her. 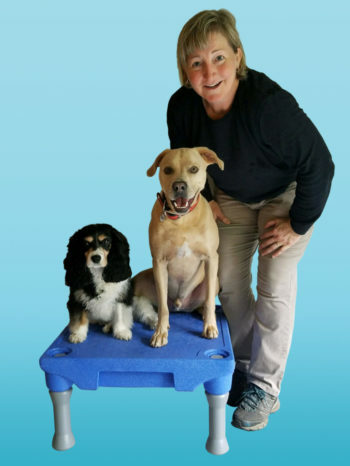 We highly recommend working with Tracy for dog training. In addition to Tracy being the very best Dog Trainer in the area, (and this is no exaggeration) she also has a true and genuine love for dogs and it shows in every action she takes. ~Terry's Pet Stop class called “Learning Manners” lives up to its’ name. The summer of 2016, I rescued a 2.5 year old, 9lbs, one-eyed Pomeranian mix, who is now known as Pippa. From the little bit of paperwork that came with her, it appeared she had been surrendered to a shelter before the age of one and lost her right eye at some point along the way. The first few months after her rescue, Pippa's demeanor was quiet and sweet but as time went on, her imbedded fears started to surface thru aggression towards people and other dogs. I quickly realized that I needed to take some sort of action to fix the behavior if I planned to keep friends, family and neighbors around. We began attending an introductory dog training course at a highly recommended establishment and although the classes were good, they seemed to be geared towards medium to large sized dogs. With Pippa being so small, some of the suggested body language to handle the corrective behavior didn't always apply to a dog her size. I could see many other classmates and their dogs gaining a lot from the class but it wasn't working for Pippa and me. After this class, we tried a personal trainer and yet another class but again, it was minimal progress. Just when I thought I was completely out of options and needed to find a home outside of the public reach, a friend forwarded me a flyer from Terry's Pet Stop for Small Dog Socialization Play Dates (all bad behaviors welcome). I called right away and signed Pippa up! I came to learn the socialization class was a new business venture for Terry (of Terry's Pet Stop) who was teaming up with trainer, Tracy Drummond, to provide classes focused on small dogs. Even though the card said "all bad behaviors welcome", I was still nervous walking into the first class. What we discovered was a very experienced trainer and a welcoming environment that encouraged positive behavior. Tracy's expertise and easy guidance in social situations was invaluable. Pippa was able to be in an open space and interact with other dogs without me having to apologize every other minute. When Terry and Tracy announced the first "Learning Manners" course, Pippa and I couldn't sign up fast enough. I learned how to correct her bad behaviors, calm her anxieties and encourage good behavior in new ways. There are a lot of how-to books, blogs, training videos, etc. out there that tell you the "should" and "should nots" but they don't explain the "whys". Tracy, having a background in people training, has a way of explaining dog behaviors and human responses in a way that makes everything click. This course had corrected my reactions and management of Pippa's natural instincts, which in turn changed Pippa's behaviors. They weren't complicated or difficult changes, just simple and easy little lessons. Each lesson took us a step closer to happy dog /owner household. Since the class, I've had family, friends and neighbors comment on Pippa's positive change. They are amazed how far she has come from what was an angry and aggressive dog, to an everyday dog that enjoys walking down the street. It’s so nice for us to go to friend’s homes to play with their dogs without the fear of her creating a doggie brawl. If your small dog has any bad behaviors of any kind, SIGN UP for this class!! Whether the issue is small or so big that it's causing you to lose sleep, Terry and Tracy's course is easy, friendly and has REAL RESULTS!!! Don't hesitate….. it made all the difference for my fur baby and me. I can't sing their praises enough!! A beginner obedience & manners class for small breed dogs of any age. Basic commands – Sit, Down, Stay and Come. Social Graces – greetings, jumping up, barking. Household Manners – mouthing, chewing, stress reducers. A socialization and obedience class for small breed puppies 6 months, or younger, at the start of class. Socialization at a young age is the key to a well-behaved dog. This is a fun and informative class where the puppies learn to meet, greet and play. EVERYTHING you need to know about housebreaking a puppy or adult dog. What's the difference between potty outside or using pads? Is there a way to virtually foolproof the process? Can I do this and work?